Read here about jewelry that incorporates, or is inspired by, tensegrity structures. Jewelry refers to plastic art used for personal adornment, including brooches, necklaces, earrings, or bracelets. Arnold Martin creates fantasy rings. He recently posted a photo of a 6 strut tensegrity tension mounted on a ring. For more details, see here. 6 strut ring by Arnold Martin. For information about ring-shaped tensegrities, see torus; for pages with ring-shaped struts see Strut, Ring. Andrew Last is a jeweler residing in Dunedin, New Zealand . Below are photos of a tensegrity necklace he created. Bill Gonor introduced him to tensegrity, and he set out to make a jewelry version of Snelson's Rainbow Arch. Last wrote: "Mine is a rather poorer version of repeat 3-strut units. It makes me respect Snelson's work all the more. The necklace is made from aluminium struts & stainless steel wire tension elements. I made a neat way of joining those elements, see the top units in the attached photo. The necklace has a catch that allows the chain to be broken & fitted around the neck. The steel wires are solid (not flexible) & each wire has a short 120deg bend either end. In the image, the bottom units show the bent part of the wire hooking into the opening of the aluminum tube. The upper tubes have 4 small slots filed at the end of the tubes. The steel wires hook into 3 of the slots & the projecting (mitred) tabs at the end of the tube are hammered over, closing the tube & locking the wires in place. There is a small amount of movement possible in the connection between the wires & tube. It is a cold connection, not soldered." 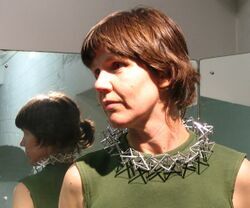 The necklace is constructed of 16 iterations of a 3 strut tensegrity. A smaller radius model makes a fine crown. In August 2012 Chelsea Lipham and Richard Colwell of C-and-R-create published a tensegrity concept necklace composed of fishing line and brass tubes. Below are photos from their website, www.candrcreate.com. Gwen Fisher is a bead artist who also publishes on bead topology . In October 2014 Fisher rendered a small 6 strut-based structure with beads. She was inspired by a 6 strut tensegrity composed of six pen tubes, eight hair bands, and twelve bobby pins. The result is a unique creation composed entirely of beaded thread: six bead-delineated struts supported by a surrounding network of beaded thread. 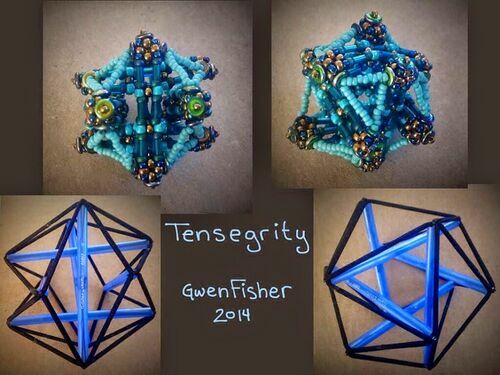 Beaded Polyhedron in the shape of a 6 strut tensegrity by Gwen Fisher. Fisher wrote : It took me several tries to finish with this piece above. I tried first with bugle beads, but my results were quite wonky. Eventually, you see above that I made six separate sticks with cubic right angle weave (CRAW), and I embellished them to stiffen them. Then, with a seventh piece of thread, I assembled the sticks, using tiny seed beads (where the hair bands would be). It turned out to be a lot harder to bead weave this piece than I expected. With the hair bands, the tension balanced everything and the tubes sit in a position of least energy. With seed beads, I was using a number of beads to determine the distance between the ends of the stick. I had to get the counts just right or it would sag when I used too many, or bend out of symmetry when I used too few. I know because I made errors both ways. "Try and see what happens." Fisher used standard beading thread, since elastic beading thread is cheaply made and does not last as long . This page was last edited on 24 November 2018, at 18:05.